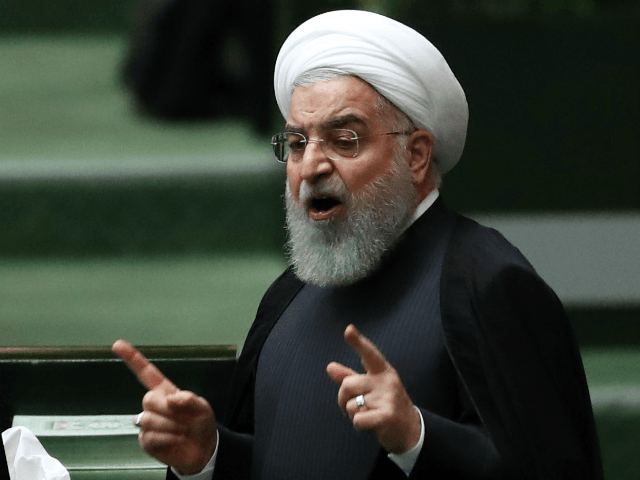 Iranian leader Hassan Rouhani has pledged to file a fresh lawsuit against U.S. officials for “crimes against humanity” in the form of economic sanctions, after the Trump administration re-imposed sanctions on the regime after canceling Barack Obama’s nuclear deal. “These sanctions amount to a crime against humanity,” he explained, explaining that should the Iranian court find U.S. officials guilty, the regime will then take the case to the international courts of justice. The Iranian regime has previously experienced victories within international tribunals, with the International Court Of Justice (ICJ) ordering the United States last October to ensure sanctions would not affect humanitarian aid or civil aviation safety. The U.S. re-imposed range of additional sanctions against countries importing Iranian oil last November, citing the countries continued sponsorship of terrorist organizations such as Hezbollah. The sanctions have resulted in a serious economic downturn to the country’s struggling economy, with oil exports plummeting and the Iranian rial losing two-thirds of its value since this time last year. Meanwhile, Iranian politicians blame their woes as a consequence of an “economic war” led by America. Nevertheless, many blame the country’s theocratic leadership under Supreme Leader Ali Khamenei and are demanding regime change, with mass demonstrations taking place around the country over the past year. “Let the world know that what America has done is not against Iran or nuclear technology; rather, it is against the well-being, environment, food, medicine and the lives of the Iranian people,” Rouhani concluded. “The thieves ambushed us, our progress briefly slowed down and things became a bit difficult. A superpower like the U.S, the Zionist regime (of Israel) and the region’s reactionaries all joined forces to bring the Iranian nation to its knees and take their 40-year revenge,” he continued.